← New look to NFO galleries – be seated first! February is the latest month I can still image the Orion region, and Orion’s Belt is very well-placed due South for me during February. The Belt region is full of faint emission and reflection nebulosity that favours dark skies and long integration times for imaging. 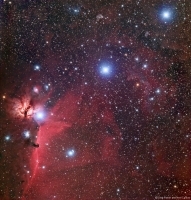 The accompanying 2-frame mosaic using the Sky 90 at f#4.5 and the SXVF-M25C one-shot colour camera covers an area just over 4 x 4 degrees. This image includes not only one-shot colour data, but also narrowband H-alpha and H-beta as well which really sharpens the whole image up. Total exposure time is in excess of 40-hours and it could still do with plenty more. Some additional OIII data and R72 (infrared) data would also further improve this image. There is so much going on here that a very high resolution mosaic using every narrowband filter you have would pay back huge dividends in the final image quality. You also need to cover quite a large field of view, and my 4 x 4 degrees is rather on the tight side. Until March 2009 – happy imaging and clear skies! !